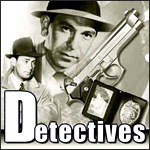 True crime stories are introduced by real police officers on Calling All Cars, one of the first cop shows on radio. Most of the cases that were dramatized on the program came from the files of the Los Angeles Police Department. In fact, the only recurring character on the series was Sergeant Jesse Rosenquist, police dispatcher for the LAPD. Detectives would take clues -- a threatening letter, three curved bullets, words from a victim’s pet parrot, a bit of information from the Records Department -- and follow them through to solve crimes like robbery, arson, kidnapping and murder. At the end of each show, listeners would be told how the criminal was apprehended and how justice was served.